I came across several of these larva this afternoon. They moved very fast and looked almost like fat miniature millipedes. I've never found one or seen one but now I want to. I seem to find a lot of them (well, at least several) by our rock wall garden. Believe it or not this is actually a millipede! 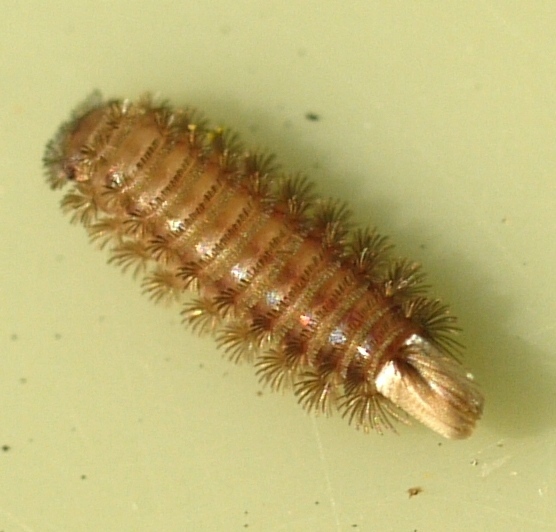 Polyxenus millipedes are covered in protective hairs, much like a porcupine (well, not quite but you get the idea). In my experience they are fast. I can barely understand how. i was sure it's a carpet larva, too... fooled me big time!